after a theme-based vocabulary/grammar lesson, e.g., call a doctor's office to make an appointment AFTER learning about (1) body parts (2) how to talk about problems (3) how to give suggestions/advice (4) WH questions. Ss will put what I have covered in past lessons into use. to deepen comprehension of a reading passage, e.g., a scene in a chapter of the novel you're exploring together or an event in a news article. Ss will have to read the text at a deeper level in order to enact scenes/events. To make things interesting, you can assign different events, or different perspectives to each group. engaging communicative activities are a norm in your classroom so ss come to class expecting to do these kinds of activities. If they've been doing worksheets & drills since your first lesson, they might be apprehensive about suddenly having to put themselves out there. Here are several engaging ESL activities you can use as baby steps. 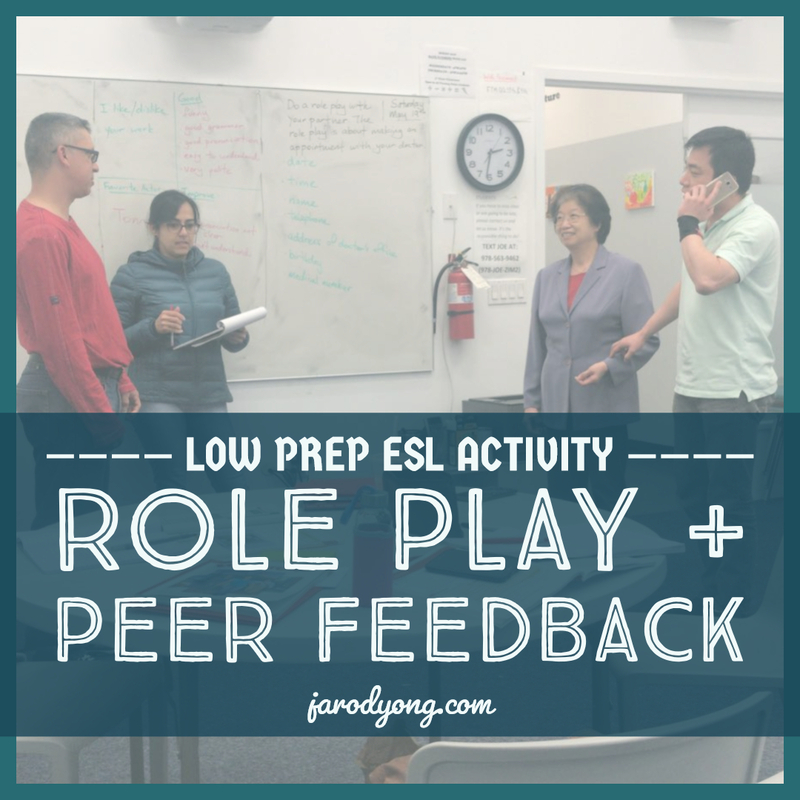 Briefly go over the language (vocabulary/grammar) that they need to perform the role play. This primes ss to achieve the objectives in your syllabus; e.g., so ss don't use the simple past tense when you wanted them to use the present perfect. You might need to introduce the idea of role play too. Write "Role Play" on the board & ask, "does anybody know what role play is?" Have a few ss share their definitions before chiming in. Basically, it's a show. Every person is an actor & has a role. Write the task on the board & give instructions, "(Describe the task) Call your doctor & make an appointment / act out scene 1 in chapter 3. Every person in the group must have a role & say something. Speak only English in your groups. Be creative. Think out of the box. You have 15-20 minutes (depending on the difficulty of the task) to get ready. Surprise me. Go!" Set a timer. While ss are preparing, walk around to monitor & assist. When time is up, provide a set of sticky notes to each group & explain how each individual is going to provide peer feedback, "You are going to help your friends improve. Take 1 sticky note & divide the paper into 4 parts." On the board, draw the feedback table provided below. Describe the different quadrants & some examples. "We want to keep improving our English & what you write will be very helpful to your friends." Each group draws a number or straws to determine the order of group performance. Enthusiastically call upon group 1. Them perform their role play. Applaud at the end. Give ss 1 minute to complete their feedback. Collect the feedback notes & leave it upside down on the target group's desk. Tell them not to read the feedback until the end. Enthusiastically call upon the next group. Them perform their role play. Applaud at the end. Repeat Step #8-10 until each group has performed their role play. "Now, read your feedback & talk about it in your group. You have 5-10 minutes." After 5 minutes, do a quick debrief. Ask each group, "(1) how many likes did you get? (2) Who are the favorites in your group? (3) Tell me 1 thing you did good. (4) Tell me 1 thing you need to improve." I like / disliked your presentation.